Reinforcing your basement walls is now easier, more affordable and less intrusive than ever. Carbon fiber wall repair with reinforcing basement wall straps is the most economical and attractive method for strengthening your basement walls. In fact, if it’s strong enough to use in areas such as bridges, commercial buildings, agricultural silos, steel and concrete tanks, steel pipes and PCCP, and manholes, then it is strong enough to hold your basement wall! Don’t let the weight and the bulky size of steel I-Beams lure you into a false sense of strength. When applied properly, StrongHold™ Carbon Fiber Reinforcing Straps are over 10 times stronger… and over 40 times lighter THAN STEEL! By virtue of the StrongHold™ design and installation process, these composite straps will prevent your basement wall from continuing to bow due to soil pressure. Carbon Fiber is less intrusive and maintenance-free! The Carbon Fiber installation process does not require excavation or drilling. It installs easily, usually in less then one day, without the need for heavy or noisy equipment. Meausring at only1/10 of an inch in thickness, it installs nearly flush to the basement wall, which means you won’t lose valuable storage and living space! As an added benefit, it’s maintenance free and will never corrode! 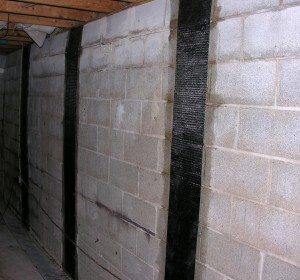 If your foundation wall is bowing, carbon fiber reinforcement may be a great option for stabilization. 3D Structural is a certified installer of Chance® Helical piers and Helical Wall Anchors, Atlas Resistance Piers, Atlas Copco Micropiles, Carbon Fiber Reinforcement Polymers, Crack Injection Systems, and Hydraway Drainage Systems. We have established a long-term relationship with our product distributor, Midwest Diversified Technologies, which ensures that we’ll have everything needed to complete your project on time.